The dim and barren Dreadlands are the home for Demon Hunters in Diablo 3. Their everyday life is ruthless demon slaying and battle for survival. Their aim is to track down and annihilate every hellspawn. Every tool that serves this purpose is good enough - Demon Hunters are training to be swift and acrobatic, they use gadgets, traps, even dark and shadowy arts if there is a need for them. Anything that will exterminate the demonkin will be put to good use. All Demon Hunters possess something special within them that helps them resist the demonic corruption. However, their lives weren't always like that. The famous historian And al-Hazir in his adventures has met a special Demon Hunter girl who shared her story with him. When And al-Hazir was traveling through the frozen wastelands heading to Bronn to stay overnight, he found that the town was in flames and there were countless charred, dismembered and half eaten corpses laying on the pavements. Thick smoke was choking the lungs of the historian but his curiosity and adventurous spirit drove him forward. As he reached the inn he found out that it is infested with terrible creatures from beyond the grave. Not only the land that was once peaceful and prosperous was plagued by monstrous hellspawns, also the towns and cities had failed to resist the horrible invasion of demonic creatures. One of the creatures, apparently their leade,r grabbed the explorer in its claws and and was about to devour him in its hot and foul smelling mouth. Suddenly a crossbow bolt pierced through the forehead of the monster that dropped immediately dead and caused panic among its peers. The bolt came from a weapon of a young Demon Hunter girl, no older than twenty years of age. She was dual-wielding crossbows and masterfully shot arcs of flaming bolts that one by one killed all of the savage monsters in matter of seconds. When she was done, her face turned sad. "There's no more survivors", she sighed. She was one of the Demon Hunters - fanatical battle masters sworn to destroy the creatures of the Burning Hell. When she was merely a child, her town was attacked by demons of hell. They burned her house and her family and friends were murdered in front of her eyes. She fled in terror and was hiding for several days until she was found by Demon Hunters who took her as their own. All Demon Hunters share similar stories and their unity and strength lies in their endless hatred towards their enemies - the legion of the Burning Hell. Demon Hunters are bound together to seek vengeance. If you like using ranged weapons, trapping enemies, using dark magic to confuse your enemies and tactical play, the Demon Hunter might be the best class for you. When it comes to naming your Demon Hunter, there are various options. A popular option is naming your character after popular hunter characters such as Van Helsing, Buffy, Demon Hunter X etc. Optionally one can choose names that would suit a deadly shadowy ranged character such as: Venom, Shade, Razor, Shadowstep or similar. Another classical option is to chose human names such as Scarlet, Jasper, Deidrich, Eve, Halissa etc. If you wonder how to play a Demon Hunter in Diablo 3, you should know that the Demon Hunter is the ultimate physical ranged attacker in Diablo 3. They are the masters of all ranged weapons and they are good with surviving when employing shadowy arts. If you are familiar with Diablo 2, then you'll notice that the Demon Hunter is a unique mix of Amazon and Assassin from DIablo 2. 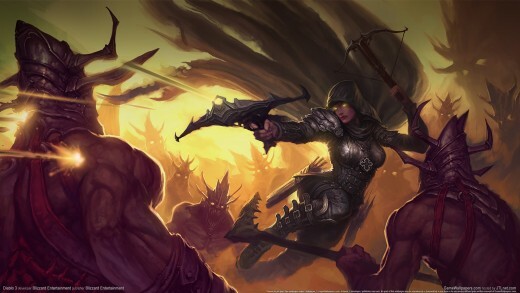 Amazon is obvious because both Demon Hunter in Diablo 3 and Amazon in Diablo 2 are ranged attackers. Demon Hunters even have their own Multishot ability. The shadowy part of the Demon Hunter is taken from Assasins who used to get various bonuses and boosts by using Shadow Discipline skills. 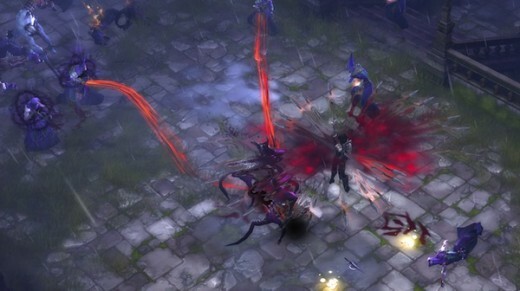 The best stats for the Demon Hunter in Diablo 3 is Dexterity and weapon damage. 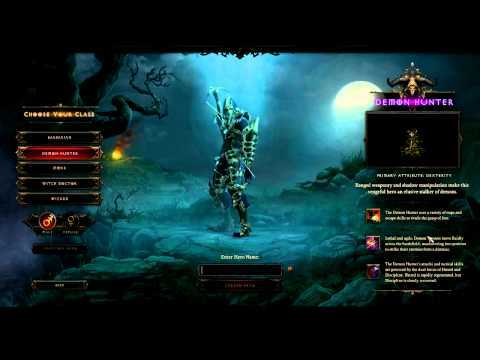 What is unique in Diablo 3 is that the Demon Hunter uses two different type of resources. These dual resources are called Hatred and Discipline. In UI the resource pool is divided in two - red Hatred bar on the left, and blue Discipline bar on the right. Hatred bar tends to replenish quite quickly while Discipline bar might take some time to fill up again To efficiently play the Demon Hunter one should balance these two bars so one should never be forced to rely only on defensive abilities and deal no damage as well as never be left defenseless because of the lack of Discipline resource. 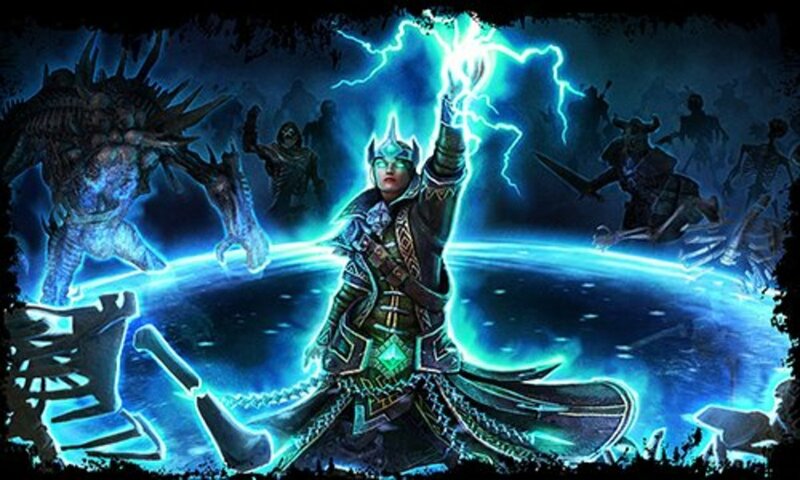 Demon Hunters are the masters of all ranged weapons in Diablo 3: lo ngbows, thrown weapons, crossbows, thrown weapons, you name them. If it is ranged, Demon Hunter excels at it. They can even dual-wield crossbows. 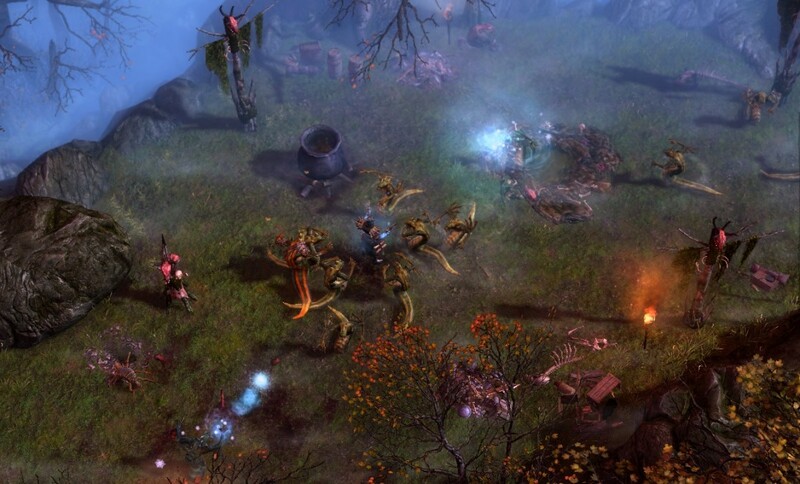 When the enemies are at range, they have almost no chance to evade the merciless rain of arrows and projectiles. But if the enemy turns out to be stronger, the Demon Hunter has a set of traps he can use to control or distract him. Packs of demons can get lured into mines that splash them all over the place. Steel traps can keep a bigger and more dangerous creature at place while the cunning Demon Hunter kills his prey at a distance. Shadow arts come in handy both in survival and to significantly boost damage. Demon Hunters can disappear in darkness to avoid the enemy or to ambush it. They can also gain the power of shadows to increase their attack power. What would be a good ranged fighter without proper crowd control abilities. Demon Hunter has plenty of them. 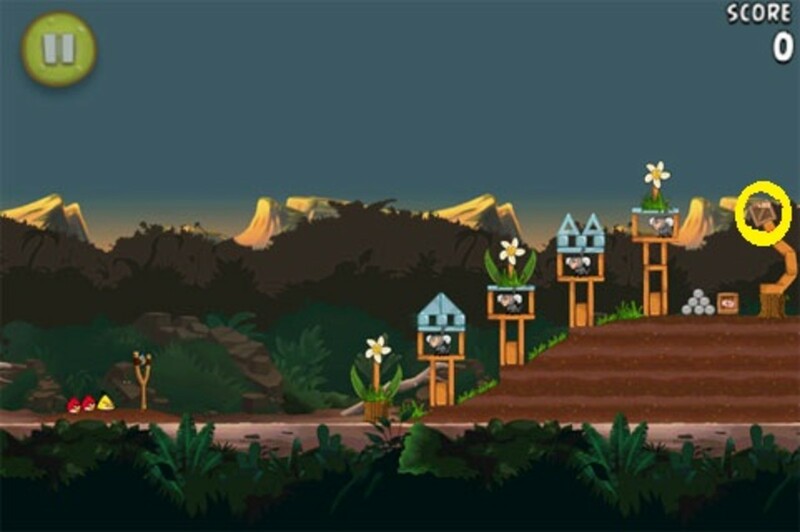 Their arrows can slow the enemies, their traps can keep them snared at place and if even these fail, the smoke bombs can guarantee safe retreat to gather more strength before facing the enemy again.